Kiyochika - The War Photographer - Kobayashi Kiyochika. The War photographer. Meiji period, 1894-95. 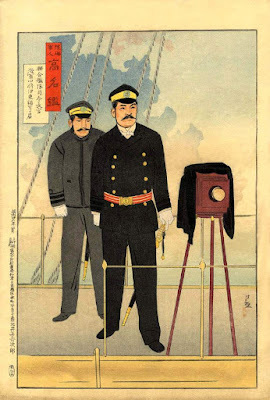 Kobayashi Kiyochika (1847-1915) (小林清親) - “Mirror of Army and Navy Heroes” The War Photographer. Kobayashi Kiyochika (1847-1915) (小林清親) is, in my humble opinion, the most visually interesting of the artists who depicted the Sino-Japanese war (1894-1895) and the Russo-Japanese War 1904-1905. He produced more than 70 triptychs and a multitude of single sheets designs, during the brief ten months of the Sino-Japanese War. The above print is from the rare series “Mirror of Army and Navy Heroes”. This set paid tribute to individual heroes, who performed their duties well in battle. We have a good selection of Sino and Russo-Japanese war triptychs, however, the single sheets tend to be much rarer than the triptychs with the exception of the single sheet series "One Hundred Laughs", these humorous war propaganda prints are still not to difficult to find. However, some of the triptychs by Kiyochika are exceedingly difficult to find. A "Photo-journalist". Naval officers standing in the background. Date: 1895 (Meiji 28), March. Impression: A very fine impression. An atmospheric printing with superbly and thinly printed bokashi in the background as well as on the deck boards in the foreground. "Sailor Tanaka Ichitaro" - The blinded sailor. "Lieutenant Manu Ganjiro of the Ninth Torpedo" - The "One man torpedo". About twenty more designs are available. Please inquire. The above group of prints comes from a large family collection of ukiyo-e, which we bought last year in Kyoto. The prints were all Meiji period prints and collected between the late 1870s- 1908. They were all kept in the family "Kura"(1). All prints from this collection are in fine condition. They have not been touched since 1908 but kept in the same chest in which the original owner placed them. Most of this collection was bought by one institution. However, some were not, due to previous content of their collection they did not want to have duplicates. Of the remains, we are offering prints from the above set for sale to our blog readers. 1. Kura is a specially built house meant to be fire, earthquake and burglar proof. It was a very expensive structure to build. Very rich families kept their family treasures, gold, money and valuable commercial goods in the Kura. If the Kura contained commercial goods it was usually divided into parts, a commercial stock part and a private part, sometimes two separate "Kura" were built. The above website has been highly controversial. You should read the text by Professor John Dower of the history faculty and Professor Shigeru Miyagawa of linguistics and of foreign languages. Please follow this link to read about the controversy.